This blog entry is a reproduction of a paper I delivered at the annual SeSAH conference in Athens, Georgia in 2012. I, too, “have sweated through fog with linguistics and contenders.” I, too, “have pried through the starts, analyzed to a hair,” search for the basis of a virile and indigenous art. Holding on in silence to this day, for fear of foolish utterances, I hope at least that my words may carry the weight of conviction. 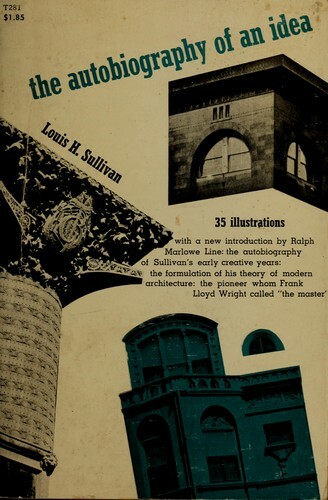 Revisionist historians have explained their return to the literary sources of Sullivan’s architectural theory as an attempt to rescue his oeuvre from the reductive interpretations modernist critics applied to his work at the turn of the century. Even today, the summary view of Sullivan as the proto-functionalist, the author of the dictum ‘form follows function,’ continues to haunt contemporary scholarship. While recent scholarship has revived Sullivan’s interests in nature, poetry, and American art, these efforts have not equally resulted in a demolition of the binary conception of Sullivan’s work. Indeed, not one of the revisionist historians attempting to rescue Sullivan’s poetic intentions has accounted for the poetic or literary purposes of his continuous references to Darwinian principles of growth and development. It is as if any mention of these principles will revive the proto-rationalist waves of interpretation that will not subside. However, the best way to interpret these two halves of Sullivan’s scholarship is to put them into conversation with one another, much as he did in many of his turn of the century essays. A dialectical consideration of this work is necessary to present a balanced account of his thought, especially considering how proud he was of reading “Spencer, Darwin, Huxley, Tyndall, and the Germans.” The evolutionary theories of Charles Darwin and their application to Sociology by Herbert Spencer and Aldous Huxley had become common references in 1920s America. Spencer and Huxley popularized Darwin’s ideas for a lay audience and made them accessible to a broad audience – so much so that these ideas became known in American newspapers in circulation during Sullivan’s lifetime. In this paper, I will outline the literary and poetic function of Sullivan’s references to rationalist and evolutionary theories of cultural development in The Autobiography of an Idea (1924). This creative memoir is the most concise summation of the architect’s architectural theory, which merits reconsideration for its explicit references to the scientific principles of Social Darwinism, as they were understood in the 1920s. In the second half of this letter, Sullivan clarified a particular habit of mind he had developed for thinking about everything he designed as an organic whole that allowed him to “see the end at the beginning” and to treat all “parts in due relation to each other.” All of this was in keeping with the principles of architectural organicism laid out by European architects such as Eugene Emmanuel Viollet-le-Duc and Gottfried Semper earlier in the nineteenth century, sources that Sullivan became familiar with by reading the trade journal American Architecture and Building News, among others. In a second letter, dated 2 February 1922, Sullivan again noted the inherent benefit that the autobiography offered for weaving a progressive narrative that compared his physical and intellectual development. His comments on this occasion, however, more forcefully illustrated the biological and evolutionary cast of his thinking. In the February letter he states, “The entire purpose of the work is set forth as interestingly as may be the instructive beginning, the slow awakening, the coming into consciousness, and the steady growth to maturity of an IDEA! The curious whip and wherefore of it all – the various influences – acting and reacting with its congenital character.” His reference to “various influences” and his use of the phrase “congenital character” was in keeping with biological depictions of ontogeny, including the theorists Herbert Spencer whom Sullivan had admitted to reading for some time. Ontogeny was the term used to describe the origin and development of an individual organism from its birth to its death, which fits Sullivan’s textual depiction of his own personal growth. He marked his architectural beginnings at age 14, but thought a cursory account of his pre-architectural thought would aid the reader in following the gradual transformation of his adolescent love of nature into a clear organic philosophy. He even engaged in a debate with Whitaker about whether to describe his childhood as exceptional or routine. In a letter dated 13 February, 1922 Sullivan wrote that he wished to entitle the first chapter “The Wonder Child,” which would have been introduced by a quote taken from Walt Whitman’s poem “Leaves of Grass.” Whitaker objected, however, to the esoteric nature of this description and renamed this section “The Child” in the final version. 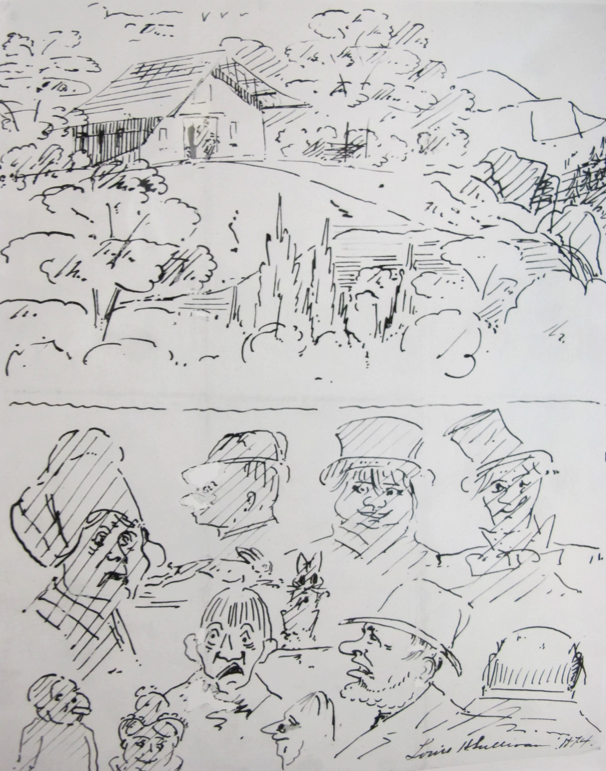 The first few chapters of Autobiography recount the Sullivan family’s European background and artistic pursuits, including drawing, dance, and music, as well as the pastoral atmospheres Sullivan spent most of his time in, including the surrounds of his grandparents’ farm in a Pennsylvanian suburb. This early exposure to art and nature reinforced the seeming inevitability of Sullivan’s eventual organic interpretation of architectural ornament, a developmental arc that purposefully emulated his individual growth into manhood. Yet, Sullivan’s individual growth was not the only ‘flowering’ at stake in his memoir. He described the collective growth of entire cities he visited, and made very broad claims for American art by the close of the text. This more collective orientation reflects the phylogenetic principles of growth outlined in biology, which accounted for the evolutionary development and history of a species or higher taxonomic grouping of organisms. For Spencer and other social theorists, societies were organisms in their own right that recapitulated the biological imperatives of individual beings at the collective scale. According to this line of thinking, their transition toward greater organizational complexity was propelled by the hybridization of the best and the brightest cultural producers over time. Spencer used the terms ontogeny and phylogeny to describe the developmental patterns of individual and collective organisms respectively. Sullivan’s Autobiography keeps to this distinction by clearly illustrating his personal contributions to the “American race,” as ethnicity was then understood, in the hybridization of his Irish, Swiss, French, and German roots. In addition to the evolutionary account of his family history, Sullivan used physiognomic descriptions to essentialize the moral and intellectual characteristics of the important people, buildings, and urban environments described in the text. Taxonomic descriptions are an important atmospheric aspect of Autobiography. Sullivan provided graphical descriptions of his Irish father, his deceptively French looking mother, and even made several casual reference to Jewish speculators whose deceptive “wiles” forced his parents to prematurely migrate to the United States. Such descriptions rehearsed many of the scientific racisms that were circulated in the 1920s, all of which served to reinforce the ethnic and class divisions of modern America. An interesting aspect of the ethnic traditions Sullivan privileges is his implicit elevation of the respectable aspects of his European heritage. His maternal grandfather is described as a “straight German of the Hanoverian type”, while his maternal grandmother is shown to be a Swiss-French citizen with a recognizable “Florentine nose.” The middle-class values of his maternal side of the family are prized over the street savvy that transformed his father into an independent man, though not sufficiently enough to avoid being swindled by the ‘unscrupulous Jew’ mentioned above. The use of physiognomy to describe the moral and intellectual character of human beings had reached America in the form of turn of the century handbooks on the subject. According to the 1909 auction catalog of Sullivan’s personal library, he owned several books on physiognomy including Johann Caspar Lavater’s Essays on Physiognomy (1804), Max Nordau’s Degeneration (1895), and an 8 volume illustrated set of Alfred E. Willis’ Treatise on Human Nature and Physiognomy (1880). Nordau was an enthusiastic reader of Caesar Lombroso’s criminal anthropology, and later applied the principles of this pseudo-science toward his reading of artists as a ‘positive’ form of social degeneracy. Willis’ work was commonly cited for its summary reading of eye, ear, and nose features including the physiognomic depiction of the Florentine and Jewish nose; two type forms explicitly references in Sullivan’s Autobiography. Willis’ textual depiction of the overriding qualities of Jewish peoples is also mirrored in Sullivan’s memoir on several occasions. As they moved into the little harbor of Dieppe, what was left of Louis gazed at the quaint city with acceptance and delight. How different from England. What a change in physiognomy. Just as a nature poet goes into great detail personifying the subtle and ephemeral aspects of the natural environment, Sullivan considered buildings and cities to have character. He wanted to communicate what kind of character American cities had in comparison to European cities such as London and Dieppe. He also wished to communicate how such characters could be purposefully shaped to reflect the main idea of his memoir – the idea that Democracy did not have to be a pragmatic reflection of Capitalism, but a defense of the spiritual potentials of American individualism. Even if America had not become the great nation Sullivan believed it should be, he was willing to offer his own personal growth (his ontogeny, if you will) as a pattern for the future growth of the nation (its phylogeny). Only in the form of a creative Bildungsroman could Sullivan use the form and content of his memoir to communicate this message. Well, Louis dear, ye know war’s a sad business; those men ye saw had just been mustered out of the army; they were good fighting men, but all tired out. From the shawls the women wore and the dirty childer, everyone knows, the Irish won the war. Think of it! Holy Virgin! – the Irish fighting for the naygers! What will it be next time? But Mother in her excited way was rampant. What! Would she permit any man to say aloud over the body of her pure and precious infant the he was born in sin and ask for sponsors? Never! That settled it and they named him Louis Henri Sullivan… the name Henri, obviously, was to deify Grandpa. The Sullivan could not be helped. It was scorned by all but its owner. They detested the Irish, whose peaceful penetration of Boston had made certain sections thereof turn green… So sometimes she gallicized the name; which wasn’t so bad, when she used it in the third person, nominative, singular. However, despite the protracted destiny of the Irish people in America, individuals seemed to fair well by using art and architecture to elevate their inherited social position. In addition to the social development of Louis Sullivan, one could point to the example of John Edelman as a fellow Irishmen who illustrated the real social promise of Americanization. His was the story of the underdog, and he wished to complete it with the triumphant varnish that success would bring. That this varnish was a fiction was beside the point; for as he stated in his letters to Whitaker, he wanted his readers to see the end from the beginning. From our vantage point today, it is only possible to interpret the full cultural significance of Sullivan’s writings by examining his integration of race and style categories in the 1920s. Instead of fearing the return of Sullivan the proto-functionalist, we should fear a reductive interpretation of his social vision for architecture. For as embattled as it was, it was honest and observant in many things – and this is something that we need to continuously remind architects is an important function of their art. Despite achieving the same basic materialist integrations of architectural form and structure as his European counterparts, at least in the most canonical examples of the Wainwright, Guaranty, and Carson-Pirie Scott buildings, Sullivan’s interpretation of naturalism went beyond the immanent expression of structural forces as its main goal. His aesthetic system also sought the means to poetically express the individualism and democratic character of a national people, the “American race” as he called it, by taking the traditional emphasis on biological evolution (the most immanent interpretation of physiognomic expression in the nineteenth century) and turning it on its head. Instead of looking to the natural taxonomic character of a people to serve as the external image of organic resolution, Sullivan’s expression of the progressive spiritual and political characters of Americans dressed its architectural forms in an ornamental skin that summarized its future potential. This shift of focus from immanent characters to emergent qualities transformed the critical function of architectural ornamentation in the Chicago School at the turn of the century. With his new sensibility for architectural physiognomy, Sullivan exploited the transparency of European organicism by grafting a physiognomic portrait onto American architecture that simultaneously captured its current physical formation, but pointed forward to some future potential. This was appropriate for an America that had not yet lived up to its full potential, with Chicago as the “Second City” of American providing an exemplary context for such a pregnant condition. Architecturally, this new aesthetic represented an implicit transformation to Bötticher’s reference to Schinkel’s use of Greek ornament as a mask. According to Botticher, Schinkel’s architecture provided an ornamental analogue to the structural clarity that was more immediate in the Gothic forms used within the Werde Church. Schinkel’s reference to Greek forms also provided a cultural ideal for Prussia, which was represented by the popular image of Greece as the birth of Republican government. Ins contrast the these clear historicist readings of traditional motifs, Sullivan’s ornament geometrically transformed the acanthus leaves that were so seminal to Greek revivalist forms into a self-referential flowering or “seed germ” that was used to poetically express the state of national development in an American context. This organicism was not only in keeping with previous organic metaphors in European architecture, but in a natural extension of these goals reapplied them to a national context that was arguably a hybridized and progressive manifestation of European precedents. That Sullivan abhorred the static repetition of revivalist ornament reinforces his organic interpretation of architectural physiognomy as primarily one of a surface condition, especially as he was not opposed to imitating historical spatial and structural typologies in the house designs and religious structures that were seminal to his architectural practice with Dankmar Adler in the 1880s and 90s. Sullivan’s reinterpretation of architectural physiognomy paralleled a shift in American anthropology that took Darwinian concepts initially reserved for explaining the teleological development of biological species, and projected these evolutionary patterns at the civilizational level to explain the concomitant growth of entire cultures. This shift in emphasis helps to explain Sullivan’s interest in Herbert Spencer’s historical account of cultural evolution as an outgrowth of nineteenth century scientific materialisms in a new form. This chapter explains how the changing emphasis of racial discourses in American anthropology enabled Sullivan to align architectural physiognomy with anthropological physiognomy in the late nineteenth and early twentieth century. In a sense, Sullivan’s masks for contemporary architectural forms was tantamount to a facelift: Sullivan’s uniquely constructed geometrical ornamentation was his means of transforming European precedents into ornamental forms more appropriate to the hybridized American citizenry he represented. This interpretation can also be used to explain Sullivan’s use of a single formal system to represent all of his clients, including Jewish-American clients who were looking for an aesthetic means to express their solidarity with middle-class ideals alongside their particular status as minorities in America. The tensions between immanence and emergence in Sullivan’s aesthetic system was appropriate for a people caught between their individual traditions and a new collective identity. However, the final hybridization of the collective “American race” was a contested reality, especially as the nation grew to its full potential. In this sense, all Sullivan could offer his Jewish-American clients was an opportunity for full participation, which his aesthetic ornament represented only too well. In fact, the social and political realities he expressed in his Autobiography reveal that Sullivan was no starry eyed romantic when it came to understanding the harsh consequences of Spencer’s theory of Social Darwinism. His affiliation with Old World Irish stock, as revealed by the non-Anglicized form of his last name O’Sullivan, was popularly thought to be inferior to the French, Swiss, and even German stock of his family tree. His literary portrayal of Irish, Jewish, and African-American peoples in the Autobiography reveals the tensions that existed between individual potential and a collective American identity in late nineteenth century America. Analyzing the relationship between individualism and cultural nationalism in Sullivan’s oeuvre enables us to locate the specific racial content of his architectural ornament for an “American race” of peoples. It also enables us to locate the racial content of architectural organicism in the so-called Chicago School more generally if Sullivan is considered the progenitor of a particular strain that was picked up by peers and disciples such as Frank Lloyd Wright, George Emslie, and Claude Bragdon just to name a few. This challenge has restored our perception of Sullivan as an ornamentalist, as well as challenged the appellation of “The Chicago School” that was typified by Carl Condit’s description of the movement as late as 1975. See Carl Condit’s The Chicago School of Architecture (University of Chicago Press, 1975). Herbert Spencer did visit the United States in 1882, but was not able to go as far ‘West’ as Chicago. However, its development was of great interest to him as it illustrated the growing evolutionary development of the nation as a whole. See the newspaper interview with Spencer regarding his visit republished as the book Herbert Spencer on the Americans and the Americans on Herbert Spencer (Appleton & Co., 1883). Is Winston (of 'The New Girl') the model post-racial roommate?